I am always in search of a good book, which is getting harder to find these days. My taste is ecclectic though it leans toward books that take me places I've never been. Through the books I've read during the past few months, I've been to China, Spain, Ireland, India, Afghanistan, Chile, Japan, The Philippines, and many other exotic places. I've lived the lives of a boy soldier in Africa, a Shanghai detective, a foreign intern in Spain, a famous geisha, a precocious boy in Ireland, and a college student in a circus train. My reviews will not reveal the plot but it will give you a general idea of the storyline and the flavor of the narrative. I make it a point to only post reviews on the good books I've read, whether from a small or big publisher, those that merit a four or a five stars. In this way, I can point my readers toward a new and exciting place on a journey they may otherwise not have taken. A few weeks ago, I was scouring the Amazon shelves looking for inexpensive, unknown books with five star reviews (yes, that’s how I save on my book money). 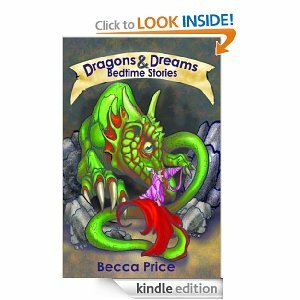 I came across this hidden jewel: Dragons and Dreams, Bedtime Stories by Becca Price. For $3.99, it was at the top of my price range for a children’s e-book, given that it only has 64 pages. But I read an entertaining sample chapter and decided to spring for the bucks. Best money I ever spent. There are no werewolves or vampires or cute hobbit-like creatures populating this book. Frankly, I am quite sick of those overwritten copycat characters. Instead, Dragons and Dreams gifted me classically-told stories, one of those rare “once upon a time” collections that are so light and charming. I was introduced to a host of interesting characters such as the ornery but misconstrued dragon that flew into the mountain and panicked an entire village or a curious faerie and a talking sunflower, and of course, the obligatory princes and princesses with storyline reminiscent of Lewis Carroll’s Alice in Wonderland and the Brothers Grimm. I particularly enjoyed “A Princess for Tea” about the misunderstood dragon, and “The Third Precious Thing,” a unique multi-perspective tale of a king and his three sons. The stories are told with hidden revelations so one can skim beneath the surface of the narrative. This is a book even adults will enjoy. Five stars for this wonderful children’s book. Discovering good books is like mining for a treasure. For this reason, I prefer to review little-known and undiscovered books. I will also review older ones as long as they are available on Kindle or Nook. As the name of my blog indicates, I will only publish reviews that I consider good reads, which to me should earn a four or five stars on a scale of one to five. I also review for Technocrati's online magazine. Publishers, if you want me to review your titles, email me at fauve9@gmail.com. I like to travel into the world of books. Books are free and take me places where I have never been.